Nepal´s top-level football clubs have to sign a minimum of 16 players in April, but the league does not start until late December. Most teams play matches for only around 5 months in a calendar year, but are required to pay players for 12 months worth of service. The dates, formats and participants of important tournaments are anyone´s guess and usually only revealed at the last hour. Such poor planning and coordination between the All Nepal Football Association (ANFA) and clubs has left Nepali club football on the brink. 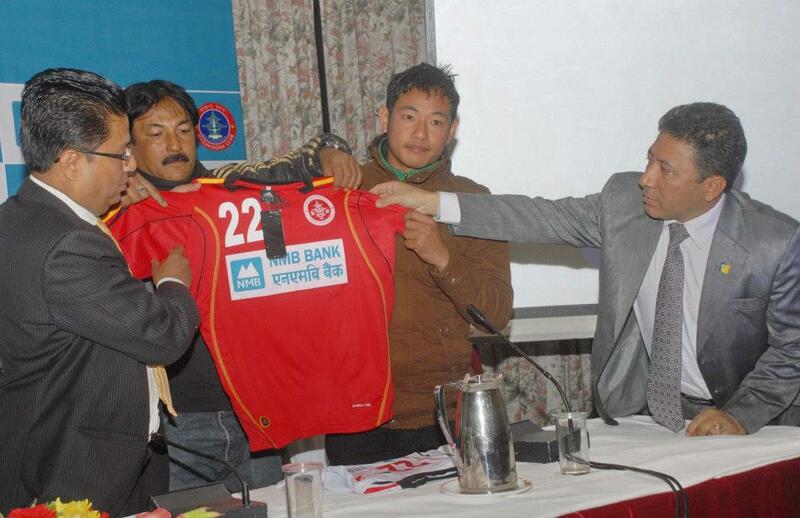 Nepal´s oldest club New Road Team (NRT) has called it quits on the ´A´ Division this year. Another historic club, Rani Pokhari Corner Team (RCT), may follow suit and has already decided not to participate in the ongoing Ncell Cup, the richest domestic cup tournament. Whispers at Nepal´s national stadium, Dasharath Rangashala, suggest that several other prominent clubs are also contemplating their footballing future. It is one of the most exciting days in Rohit Chand’s career. In a few hours time the Nepal national team player will be leaving for Denmark to train with FC Vestsjælland. Playing in a top level European league has always been Rohit’s life long ambition and soon he will have an opportunity to realize his goal if he is able to impress coaches at the Danish Superliga club. Things have been going remarkably well for Rohit since his calamitous penalty misses in the 2013 SAFF Championship. He agreed to a record breaking short-term contract with a domestic football club, signed several endorsement deals, and reports out of Indonesia claim that numerous clubs there are jostling to acquire Rohit for the new season which is scheduled to start in February. So how does the 22-year-old, whose life seems to be turning into a bed of roses, begin this momentous day? Perhaps a late rise so he can leave for Europe as fresh as possible or a posh breakfast in a swanky restaurant with friends and family? Yeah right! At 8AM in the morning Rohit is at the Laboratory School football ground in Kirtipur sweating it out on the field with players of NMB Bank Machhindra Football Club, putting in one last training session before he embarks on his Danish adventure. The irony in Rohit attending Machhindra’s practice is that several of the club’s regular players have found convenient excuses not to come to training - be it the upcoming elections, current bandhs or family obligations. But Rohit is there, trying to acquire any little edge he can to make a strong first impression in Denmark. He trains full speed with the rest of the team, participates in all the physical exercises and converses with Machhindra’s new Swedish coach, Johan Kalin, to get any last minute tips he can about football in Scandinavia. This type of dedication and determination is what sets Rohit apart from the great majority of football players in Nepal and it is why he is the only player in Nepal’s current national team that is playing in a foreign league. Call me a Rohit Chand fan boy all you want, but having covered and worked in Nepali football for the last 16 years I can say without hesitation that Rohit is a rare breed. Foremost, Rohit has ambition. While most Nepali footballers are content playing in Mickey Mouse tournaments across the country and collecting the handsome paychecks that come with it, Rohit always has had his heart set on playing at the highest football level possible. Instead of nagging his first Nepali club Machhindra about petty perks as most foootballers do, Rohit and his family requested club officials to help write his resume, create a YouTube highlights video and search for a foreign club for him. When it comes to his career, Rohit has always sacrificed money for greater opportunity. He went months without salary while playing for clubs in India and Indonesia. His close advisor Nabin Chitrakar says Rohit’s first priority when searching for a club is the level of the league and that finances are secondary. Contrast that with Nepal national team members who according to Chitrakar contact him regularly about the chance to play in weaker but more lucrative leagues such as that of Bangladesh. Rohit might be from Surkhet, but he is certainly no villager. After botching two penalty kicks in Nepal’s most anticipated football match in two decades, Rohit could have booked the first flight out of the country and gone back to the comforts of Indonesia where he is hero amongst the Persija Jakarta faithful. Instead he stuck it out in Nepal and faced the media and a sea of critics. His steadiness during such a low period in his football career won him admirers and he has been able to leverage that into a popular Facebook page and several sponsorship deals. While some prominent Nepali footballers complained about homesickness during golden opportunities with clubs abroad, Rohit never flinched. Despite payment issues, he played two years in Bangalore, India for HAL SC without a peep. He was resolute in Indonesia despite being cut by the first team he tried-out for – Arema. Even today as he is pulled in various directions with offers from Nepal, Denmark, Indonesia and Thailand, he takes it all in stride. A few more Rohit Chands and Nepali football would probably be at another level. Unfortunately, for now, there is only one Rohit Chand. One face not present at the All Nepal Football Association (ANFA) Congress on Thursday, ironically, might be one of the most important persons in Nepali football. Kumar Pradhan is a name that many even in Nepal´s inner football circles are not familiar with. The 51-year-old longtime resident of Biratnagar just so happens to be the coach that groomed national football team captain Sagar Thapa and star midfielder Bhola Silwal during their youth football days. He also played an important role in the careers of other prominent footballers including Nirajan Khadka, Buddha Chemjong and Deepak Rai. Want more? Mr Pradhan recently sent three players to the ANFA Academy, he was instrumental in organizing grassroots coaching and refereeing courses in Biratnagar (full disclosure - I worked with him on those projects) and regularly prepares and takes teams to tournaments across Nepal and India. With a resume like that, one would presume he would be a celebrity amongst the football fraternity, but in the enigmatic landscape of Nepali football he is pretty much anonymous. You will not see Mr Pradhan winning a motorbike from ANFA or a NSJF Sports Award anytime soon. The lack of recognition of Mr Pradhan highlights many deficiencies in Nepal´s sports sector, including a sports media that fails to chase stories, sports associations filled with cronies and a dysfunctional development system. In last season´s Martyr´s Memorial ´A´ Division Football League, Mr Pradhan was named the interim head coach of Friends Club and rescued a talented team from a dismal start to the league season. Under his guidance, Friends Club pulled off five victories in a row and qualified for the Super League. Despite the remarkable turnaround by Friends Club, there was hardly a peep in the news media about Mr Pradhan coaching Friends Club or his curious background. Since holding the position of treasurer of the Morang District Football Association about a decade back, Mr Pradhan has not been asked to be a member of the association in the two previous election cycles. Instead Morang District Football Association´s committee is filled with persons whose contribution to local football is quite questionable. Despite having developed 10% of Nepal´s current national football team, Mr Pradhan lacks any formal football coaching certification and his understanding of modern coaching methods and international football is limited. One only wonders what type of players he could develop if given access to advanced coaching courses and seminars. The above complaints are those of this columnist and not Mr Pradhan, who actually seems quite content with his laidback life in Biratnagar. Today, he is a sports teacher at the local Delhi Public School franchise and after classes he continues to train youths in football at Biratnagar´s Sahid Stadium. Mr Pradhan´s dedication to football is so strong that long after his family, including his wife and three of his four children, moved to Kathmandu he continues to reside in Biratnagar so that he can keep indulging in his passion for coaching football. For Mr Pradhan, being a hidden hero is not so bad. He is uncomfortable with the spotlight and feels more fame can create more problems. Just being able to coach football to youths on a regular basis is all the reward he requires. It is Twenty20 cricket like you have never seen before: non-existent crowds, no entertainment and unrecognizable teams. Welcome to Nepal's National T20 Cricket Tournament. At least they do have two sponsors - Pepsi and Standard Chartered. A recent visit to Pulchowk Engineering College ground left this columnist perplexed at the lack of creativity of Cricket Association of Nepal (CAN) in organizing Nepal´s premier T20 event. Was CAN's goal to generate or drive away interest from the sport they are supposed to be guardians of domestically? It is easy to forgive smaller sports associations that are hardly exposed to their own sport at the international level for lacking imagination, but in a country that is flooded by Indian pop-culture and by extension of Indian Premier League (IPL) and Champions League (CL) T20 cricket, Nepal's cricket organizers must either be living in a cave or extremely apathetic to not even adopt a single marketing gimmick to lure fans or enhance media coverage of their event. While Nepal might not be ready for skanky IPL style cheerleaders yet, how hard would it have been to invitea DJ, play some jock-rock, toss prizes to fans or pass out flags to spectators - all of which could have likely be done through the support of sponsors at no cost to the organizers. A prominent cricket star, whose name I will withhold to save him the grief of having to explain himself to the authorities, commented that the T20 tournament was just a formality and expecting more from Nepal´s cricket administrators was naive. Such comments are disheartening to hear, especially as Nepal sits on a cricket goldmine. As seen by the passionate packed crowds during the ACC T20 tournament recently held in Kathmandu, the fan interest is certainly there. Nepal is in a cricket-mad region, which it could potentially leverage in so many ways. This is why CAN and its partners really need to start ramping up their marketing efforts so it can start attracting the revenues to take cricket in the country to the next level. By accident or design cricket actually has severaladvantages in terms of marketability over football, which attracts the lion's share of corporate support in Nepal. For example, unlike football which primarily revolves around Kathmandu based clubs, Nepali cricket consists of teams from various regions of the country. If marketed properly, the whole concept of supporting your hometown team could really attract strong crowds. One could envision a scenario where transplants from places like Biratnagar, Pokhara and Nepalgunj congregate at TU Cricket Ground to not only cheer their local team but also reconnect with friends, family and neighbors from their hometown. CAN's logo, a rhino head, also offers some great marketing opportunities. Media could be encouraged to use the nickname “Rhinos” when referring to Nepal's cricket team and “Colts” when talking about the juniors. There could be merchandising spin-offs and marketing campaigns with sponsors based on the whole Rhinos moniker. The National T20 Cricket Tournament might be the best place to start, as the format of the competition lends itself well to commercialization and most sports enthusiasts in the country are very familiar with the IPL. CAN should start by dropping the meaningless regional numbers next to the name of the teams, have each team play in consistent colors, play the famous T20 horn over a loud speaker and engage fans with prizes, flags, etc. Add some flash. Give all the teams a nickname -Kanchanpur Kricketers, Pokhara Lakers, Kathmandu Kingz - be creative! If all this is too taxing for CAN, then they would do well to consider outsourcing events such as their T20 tournament to an event management company and let them do all the heavy lifting. Another veteran cricket player I spoke with felt that would be far more realistic scenario, “CAN would be very positive to such a proposal but the event management company would have to approach CAN as CAN is certainly not going to approach them and there lies part of the problem,” he said with a sense of frustration. So for the sake of Nepali cricket fans, if you are a marketing or event management company and want to tap into a goldmine - please contact CAN. 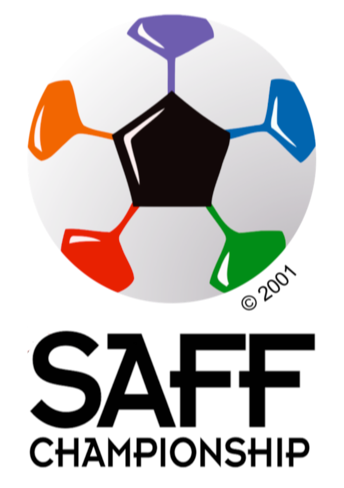 The 8th SAFF Championship presented a great boon to at least two countries. 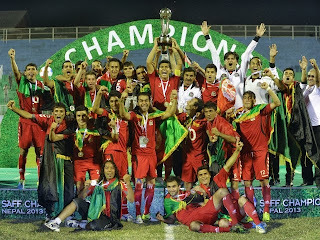 The Afghanistan national football team brought about immense joy and unity to a battle-scarred nation by claiming the tournament title. After the final whistle of the competition was blown at Dasharath Rangashala stadium in Kathmandu, Afghans of all creeds, sexes and ages poured on to the streets of their country to celebrate the victory. There were euphoric scenes across Kabul on the return of the football national team to Afghanistan. Tens of thousands of people, including Afghan President Hamid Karzai, were on hand at the airport, on the streets and in the national stadium to greet their returning national heroes. 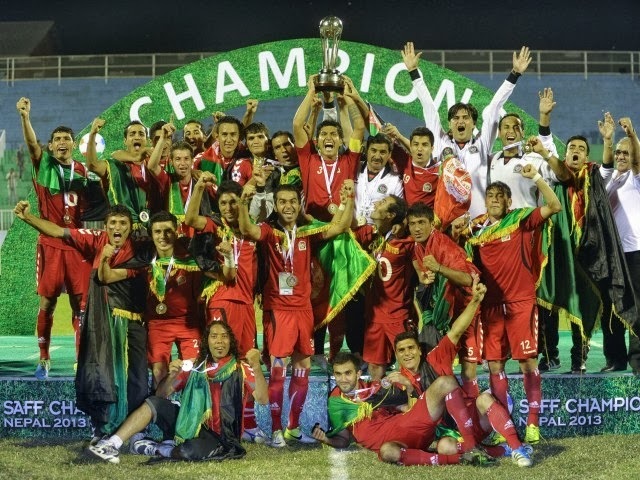 Afghanistan´s SAFF Championship triumph was well documented by the international news media and was one of the rare occasions where Afghanistan was in the news for positive reasons. Meanwhile, Nepalis also had much to celebrate during the SAFF Championship. While the final outcome was not what fans would have wished - Nepal lost in the semifinals of the competition, the national team played an attractive brand of football and defeated arch-rival India creating enormous jubilation across the country. Nepal´s tournament performance was a much-needed reprieve from the dysfunctional government, dilapidated infrastructure, and nauseating pollution that Nepalis must endure on a daily basis. In a country where ethnic politics, cronyism and nepotism rule the roost, a determined and exciting national football team that consisted of players selected on merit, from diverse ethnicities and who come from varying social and economic backgrounds provided a standard that most Nepalis long for. The SAFF Championship is an example of how sports can play a powerful role in nation building. The passion, energy, and buzz that accompany sports and sports events make it a unique and influential platform for development and for a country like Nepal that is yearning for a formula to modernize itself politically, economically and socially, sports has the potential to be an effective ingredient. From the Ping Pong Diplomacy that thawed frosty relations between China and the USA to the international sporting boycott of South Africa that played a significant role in ending apartheid, sports and politics have long been intertwined. As the national football team showed at the SAFF Championship, sports can really unite and bring a “feel good factor” to a nation. It might thus be prudent for the country to invest in sportspersons and sports infrastructure to increase the odds of Nepal doing well in international competitions. On the heels of India and Pakistan publicly testing their nuclear arsenal bringing about much celebration amongst their citizens, Nepal won 32 gold medals at the 8th South Asian Games in Kathmandu creating mass elation in the country. Former Prime Minister Girija Prasad Koirala wittily commented that unlike India and Pakistan who spent billions on their nuclear weapons, Nepal only needed to win a few gold medals to heighten national pride. Sports can be a great economic engine. Sports event usually require extra accommodation, food and transport thus stimulating the economy. Nepal´s geography and existing tourism setup lends itself well to hosting smaller sports events especially in the realm of adventure sports. Sports events also afford a city or country a great opportunity to brand itself. For example, the 1992 Olympic Games in Barcelona played an important role in transforming it from an industrial city to one that is now known for its art, culture and commerce. Imagine if Nepal were to host a cricket match between India and Pakistan. What would it say about Nepal´s capabilities? It would make an enormous statement internationally about Nepal´s security, accessibility and infrastructure. Sports generate many social benefits. Foremost, a healthy nation is a more productive nation. Unfortunately, parks and spaces to play are at a premium in Nepal. Building public areas for sports should be amongst the priorities of the nation. It would be a great investment in health and ultimately help reduce long-term health care costs. Because sports has the power to bring people together and unite them as a team, it is also a powerful teaching tool that institutions are using to help bring about social change. The United Nations even has a department named The Office on Sports for Development and Peace. The government, NGOs and social organizations would do well to follow suit and use sports to raise awareness for various social issues. As a member of the Rotary Club of Jawalakhel reminded me when I was invited to give a presentation to them on this topic, perhaps the greatest benefit of sports is the spirit of sportsmanship, something that unfortunately is sorely lacking from the halls of power to our congested streets. If politicians carried a little more sportsmanship in their veins, perhaps the country could finally have a constitution and if micro drivers had a little more sportsmanship in their brains we could all drive our vehicles without fear of getting run off the road every time we leave the garage. Any campaign in which Nepal defeats a full strength Indian football team - a feat that has not been achieved for two decades - must be considered a success. Despite bowing-out in heartbreaking fashion in the semifinals of the SAFF Championship to eventual winner Afghanistan, by and large the Nepali team did itself proud in the latest edition of South Asia´s top football competition. Nepal put on neat displays that consisted of positive attacking football and solid defending in all four of its matches. The team was resolute against Bangladesh in a 2-0 victory, scored when it mattered in a dramatic 1-1 draw against Pakistan, converted its chances in a fairly comfortable 2-1 triumph over India and played attractive football against Afghanistan, though a few infamous blunders led to a 1-0 defeat. Everyone in Nepal´s defensive line-up - Biraj Maharjan, Sagar Thapa, Sandip Rai and Robin Shrestha were probably in their best form to date. Nepal´s wingers Bhola Nath Silwal and Bharat Khawas were menacing and strikers Anil Gurung and Jumanu Rai finished their chances. Head Coach Jack Stefanowski, who unfairly has had to live in the shadows of his predecessor Graham Roberts, deserves much praise for the play of the national team and some of the bold decisions he made during the SAFF Championship. The Polish-American switched Sandip Rai to defense and brought Rohit Chand up to midfield - a strategy that seemed to be effective. He was daring enough to give an opportunity to 15-year-old Bimal Gharti Magar who ultimately netted the tying goal against Pakistan. His substitution of Jumanu Rai for Jagjeet Shrestha worked to perfection as Rai stuck the winning goal in Nepal´s match against India. Nepal´s twelfth man - its fanatical supporters, also merit high acclaim. They consistently filled the national stadium, Dasharath Rangashala, to passionately support the home team. Fan culture took a great leap forward during this tournament. There were far more fan groups, fan gear and fandom than at any pervious national team matches. Foreign players and media heaped admiration on Nepal´s fanatical following. Pakistani international and former Premier League player Zesh Rehman called the football atmosphere in Kathmandu the best he has witnessed in Asia. While certainly there are many positives to take away from Nepal´s performance at the SAFF Championship and the nation as a whole is proud of the way the team competed, at the macro level, the fact remains that Nepal still has not won an international tournament in twenty years and has not reached the finals of the SAFF Championship in all ten incarnations of the event. With Afghanistan reaching back-to-back tournament finals and winning the trophy this time and the Maldives having played the final game four out of the last eight editions and winning it on one occasion, the age old excuses for Nepal´s early exits no longer fly. If Nepal is small, poor, corrupt and politically unstable, then what exactly are Afghanistan and the Maldives? What do Afghani and Maldivian players have access to that Nepali players do not? India never seems to hit top form during the SAFF Championship but somehow seems to always reach the finals and has claimed the tournament title on five occasions. No matter how well Nepal plays it always bounces out early. Perhaps we need to wake up to the reality that Nepal´s best is simply not good enough. Maybe the lively play of the team is simply cosmetic. The popular sentiment is that Nepal played very well against Afghanistan while India performed poorly, but India had at least half-a-dozen shots on goal in the final that were more fierce than any Nepal could muster in the semifinal. Everyone seems to be using the phrase “bad luck” when referring to Nepal´s loss in the SAFF Championship. Was it bad luck or bad skill? Goalkeeper Kiran Chemjong´s drop of a routine cross, Rohit Chand´s feeble penalty kicks and Bharat Khawas´ rushed header in the penalty box when there was no defender in sight of him have little to do with luck and more to do with their shortcomings as players. Ultimately, Nepali football needs better standard players and no amount of visits to the Pashupatinath or Pancha-Bali prayers will make that happen. It will only come about if ANFA, clubs and grassroots football community start getting serious about football development. Among a whole host of deficiencies, a three-month league solely concentrated in Kathmandu, top-level clubs that refuse to invest in their training and coaching staff and an academy system that trains no more than 100 kids in a country of 30 million is not a formula for winning international tournaments, but a recipe for continued heartbreak or “bad luck” as many insist on calling it. Expecting more from the current crop of Nepali players is a tough ask - they played to their potential, kudos to them. It is Nepal´s football administrators that need to start raising their game. When Nawang Nima and Tshering Norbu Lama approached investors about financing what would be Nepal’s first futsal hall they were given many reasons why their project would fail. Perhaps the most memorable one was a relative asserting that when ten hot-blooded males are under the same roof, as is the case for a typical futsal match, there are bound to be fights and the facility would quickly be ruined. Despite the naysayers, eventually the two brothers got the funding they needed and opened Futsal Arena at the GAA Hall in Thamel. Two years after establishing the futsal facility, close to twenty more futsal halls have popped up across Nepal. 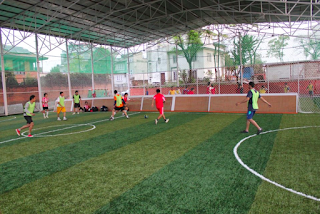 Many football aficionados are hailing the rapid rise of futsal in Nepal as a massive boon to the much more famous 11-a-side version of the game, as futsal greatly helps strengthen a player’s fundamental techniques in football and the facilities allow for uninterrupted play year round. The story of Futsal Arena is one of a growing number of examples of how determined sports entrepreneurs and enthusiasts are boosting sports in Nepal. With a dysfunctional national government and sports associations short on cash and high on politics it is these resolute sports buffs, whether they are of the for-profit or non-profit variety, that are helping Nepali sports move forward. GoalNepal.com is another example of gritty sports entrepreneurs providing the impetus for sports development. It could be argued that the highly popular website might be the most influential force in Nepali football. With millions of hits from Nepali football fans across the globe, close to 100,000 ‘Likes’ on Facebook and a recently launched mobile app GoalNepal has played a leading role in promoting and developing Nepali football. The site has turned little known players into celebrities, given robust exposure to football sponsors and provided a spotlight to tournaments and football related activities across Nepal that are normally under the radar. It has not always been smooth sailing for GoalNepal according to its founder and CEO Bikram Thapa. Nepali companies are still tepid about venturing into online advertising thus the financial challenges for the football portal have been constant. Despite the cash crunch and also overzealous football fans, officials and media members - including this blogger, giving it shtick on a regular basis, GoalNepal has persevered. The company employs twelve staff and is involved in a wide range of football initiatives. Leveraging its popularity GoalNepal launched the highly popular “I ♥ Nepali Football” campaign, assists many football development projects and is active in various charitable endeavors. Like GoalNepal, many other private sports ventures have overcome numerous obstacles and transformed themselves from startups to kickstarters that are strengthening Nepal’s sports ecosystem. The NSJF Sports Award has risen from a friendly gathering of sports journalists at a local party palace to a can’t-miss event in Nepal’s sports calendar that has helped motivate and inspire athletes and coaches especially in the less glamorous sports. ATTSH has gone from a small T-shirt store to a sports brand that sponsors a multitude of players and clubs. Adventure sports events that mostly consisted of local participants are now attracting more and more international ones thus bolstering Nepal’s sports tourism sector. A common thread between most of these sports ventures is that they have largely stayed independent from government and official sports bodies who in the upside-down world of Nepali sports tend to create far more hurdles than solutions. For example futsal tournaments, which according to football’s world governing body –FIFA, are under the jurisdiction of national football associations, do not care to ask for recognition or clearance from the All Nepal Football Association (ANFA) and hardly any of the futsal halls have bothered to invite high-ranking sports officials for their inaugurations or prize ceremonies. In a recent trip to Kaski district, Bikram Thakali, President of Sahara Club, took me to their newly built football training facility on the outskirts of Pokhara. He told me that the entire area where the facility resides used to be a jungle and many people who saw the then proposed site felt there was no way a training complex could be built there and perhaps Sahara Club was running a scam to solicit donations. Mr. Thakali said the club quickly learned there was no point talking about what they were going to do and the only alternative was to work round the clock to make their dream a reality and prove the doubters wrong. Today the Sahara Club training facility is the only proper football training complex owned by a club and it easily rivals any of the ANFA facilities built through FIFA grants. In a sports landscape that is rife with pessimism, it is the tenacity and resolve of these types of sports entrepreneurs and enthusiasts that give us a reason to be optimistic about the future of Nepali sports. There is something quite charming about sports in Bhutan. Maybe it is the mix of quirkiness and Corinthian ideals that make it so adorable. Grown men dancing and singing after a target is hit on the archery range, members of the Bhutanese royal family fully engaged in a local basketball tournament, and the president of the Bhutan Football Federation (BFF) blowing a vuvuzela during a match his club was playing in are some of the sights witnessed by this columnist during a one week visit to the Kingdom of the Thunder Dragon. Bhutan is still a long way off from leaving a competitive mark in the international sports arena. Among a number of different factors, Bhutan’s small population (around 750,000) and economic size (GDP is ten times smaller than Nepal’s) puts its sports at a distinct disadvantage at the global level. The country’s sports sector largely depends on foreign handouts and expertise to sustain itself. Despite the challenges and its relative low profile, there are a couple of takeaways from Bhutanese sports that its Nepali counterpart would do well to notice. Archery is the national sport of Bhutan. A traditional version of the sport is very popular across the country. Bhutan has parlayed the sports popularity to develop a host of Olympic archers in the international version of the sport. The Bhutan Olympic Committee (BOC) has made developing archery a priority and gives it extra attention and funding according to Sonam Tshering, general secretary of the BOC. Despite mediocre results, through archery, Bhutan has made a name for itself in the international sports community. During every Olympic Games there is sure to be a handful of media features on archery in Bhutan and many sports enthusiasts have come to know Bhutan because of the country’s archery tradition. Contrast this with Nepal, which in the guise of political harmony spreads its resources thin amongst various sports and tends to arbitrarily send athletes to international events and thus has failed to carve a niche or command attention in any sport at the global level. Anyone that has followed the ongoing King’s Cup football tournament in Bhutan will have likely seen images of the gleaming artificial pitch at Thimphu’s Changlimithang Stadium. 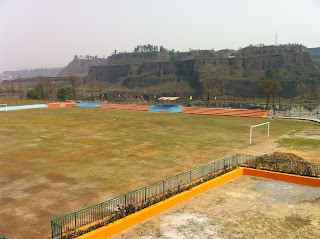 While constant rainfall forced the SAFF U-16 Championship in Kathmandu to be played on less than ideal pitches, possibly hurting Nepal’s technically gifted under-16 side the chance to win the tournament, the King’s Cup tournament has been going on without a hitch and seen attractive play because of the durable synthetic surface. 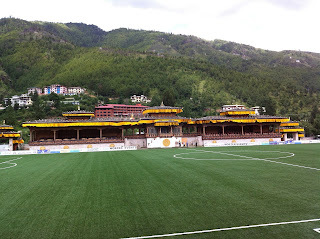 In fact, every training session of all the participating clubs has been held at Changlimithang Stadium. Furthermore, after a match in the tournament is finished, locals of all ages play under the floodlights on the same field until as late as 1AM in the morning. Along with several synthetic mini-pitches, the BFF just completed installing a second full-sized artificial field in Thimphu. 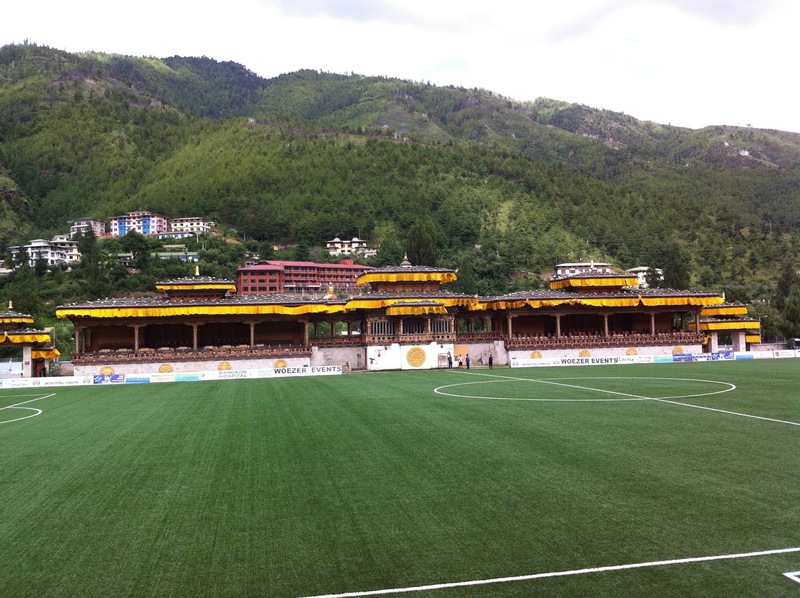 “Our focus is on installing high quality pitches over building stadiums or adding seats,” explained BFF President Ugen Tsechup Dorji, who also is the president of local side Thimphu City FC. Basketball is hugely popular with a section of Bhutan’s population. Word on the street is that Bhutan’s 4th King, Jigme Singye Wangchuk, was a big fan of the NBA and as a result quite a few Bhutanese, mostly in the higher strata of the country – including the King’s sons, gravitated towards basketball. This is quite evident at the Monsoon Basketball Tournament in Thimphu. The parking lot outside the basketball hall is regularly packed with SUVs. Inside there is intense competition between local basketball clubs and a healthy crowd on hand to witness it. The fact that the tallest player on the court is 6’3” and there is not a single player close to being good enough to play at the American college level, never mind the NBA, is moot to the fans. It is their local competition and they enjoy it. Similar tournaments in Nepal are often written-off as having no scope. If a sport does not have international potential it is not worth the time. Perhaps the Bhutanese might not realize it, but sports in Bhutan can teach us that there is much more to sports than merely winning at the highest levels. It can serve as great tool to help brand a nation, it can simply be about creating spaces where people can play the sport they love and it can provide an entertainment option for the community. This line of thought is quite fitting for a country that subscribes to the ideal of Gross National Happiness, a philosophy that values quality of life over commercial indicators. The SAFF U-16 Championship is about to commence and as usual Nepali football fans are clamoring for victory. With the senior national football team in the midst of a twenty-year trophy drought and club sides constantly stumbling in continental competitions, football officials and enthusiasts are often left to turn to the junior teams to redeem Nepal’s football reputation. The number one mantra of ANFA officials the past few years has been that Nepal is the strongest country in South Asia at the youth level. Presumably this talking point was formulated as a result of Nepal’s de-facto under-14 national team winning consecutive Subroto Cups - one of India’s most prestigious youth tournaments, Nepali junior sides running up large scores in the AFC Festival of Football and Nepal’s under-16 national team qualifying for the finals of the AFC U-16 Championship on multiple occasions. Despite a few hiccups in results recently that have slightly subdued the bombast, there remain high expectations for Nepal’s youth football national teams to win. ANFA President Ganesh Thapa just the other day provided a ‘motivational talk’ to the under-16 national team and their head coach, Bal Gopal Maharjan, in an interview talked about how he plans to go all out to win the SAFF U-16 Championship and went as far as to say that a successful campaign by the junior team would inspire the senior team for the upcoming SAFF Championship. The craving for wins at the junior levels has ironically created an environment that has inadvertently stunted the development of Nepali youth players and as a consequence the senior national team, which is often criticized for lacking new blood. Most mature football nations look at youth football solely as a breeding ground for future stars. The best youth systems are the ones that graduate the most players to the senior teams - be it for a club or country. Developing players is the priority, winning games is not. Certainly, the top youth football setups such as that of Spain, France and Brazil also tend to win their fair share of trophies at youth level, but that is a testament to the depth of talent those countries produce and not really their emphasis on winning. A youth system that prioritizes development usually look to develop the weaknesses of players, give more playing time to players with long-term potential and will prepare their players to play in a system similar to that of the senior team. As an example, Spanish national teams at every level practice the exact same set pieces and all teams at Ajax Amsterdam play the same formations and with the same attacking philosophy. Contrast this with a youth system that emphasizes winning. It will only focus on the strengths of its players, give playing time to the bigger and stronger kids that can impact a game immediately and play whatever formation and style that will help secure victory in the next match. Nepal currently subscribes to the ‘win at all costs’ philosophy. As a result, we see scenes where coaches play star youth players carrying injuries even if it puts their future careers at risk, officials berate young players for making mistakes damaging their psyche and passion for the game and different formations and styles are utilized from one youth national team to the next. The former wonder kid of Nepali football – Nirajan Malla, was put under immense pressure to play in the 2009 AFC U-19 Championship qualifiers despite cracking his right ankle a few days before the tournament. Hang around Nepali youth players and one will probably see just as much fear as excitement in their body language. It is easier to guess tomorrow’s weather than how a Nepali youth team will lineup or play. The ‘win at all costs’ culture has deeply corrupted youth football in Nepal. There is still very little vigilance in vetting over-age players. Youth tournaments lack sportsmanship and are rife with fights, boycotts and protests. The news media have also corroborated by giving undue importance to results of youth competitions and regularly using insensitive jargon such as “destroy,” “demolish” and “slaughter” when verbalizing scorelines. Nepal’s attitude towards youth football has ultimately comeback to haunt its senior national team. For example only one player, goalkeeper Ritesh Thapa, from Nepal’s under-16 squad that qualified for the 2000 AFC U-16 Championship in Vietnam has been a regular fixture in the senior national team and the ANFA Academy, which pretty much has monopolized selection for the youth national teams, has only produced a single player in Rohit Chand that currently plays in a formidable foreign league. So as the SAFF U-16 Championship gets underway it would be prudent for all of us – fans, coaches, officials and media, to focus on the development and maturation of Nepal’s players and not whether they lift the trophy in two weeks time. I've long believed for Nepali sports to grow, we must develop Nepal's "sports ecosystem". Blogs, Websites, TV Programs, Award Shows, Sporting Good Stores, Player Agents, Fan Clubs, Sports Consultants, Venues for Sports, even Gossip Sites all help strengthen that ecosystem. To add to this ecosystem, I've teamed up with Pradipan Thapa to launch the Inside Nepali Sports podcast. 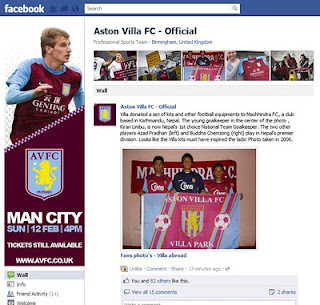 A little while back Aston Villa solicited and posted photos of their fans from around the globe on their various online platforms. Among the photos was one of three Nepali soccer players wearing Aston Villa uniforms. Aston Villa had donated the kits to Machhindra FC, a top-flight football club in Nepal, where the players were plying their trade at the time. 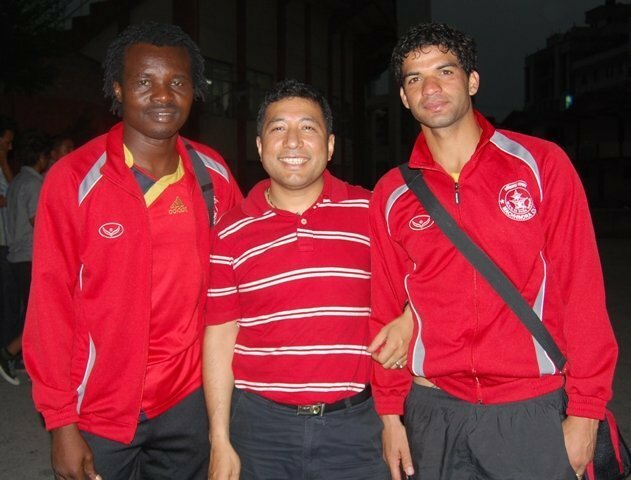 The photo was taken about six years ago and I was quite curious to find out whether the three footballers in the photo – Azad Pradhan, Kiran Chemjong and Buddha Chemjong, all well known soccer stars in Nepal, had become Aston Villa supporters since receiving those kits. I’ve been around the Asian soccer scene long enough to have a fairly solid idea of what the answers to my inquiry would be and indeed my hypothesis on the matter proved to be correct – none of the three players had become Villans. Azad and Buddha are Manchester United fans and Kiran is a Chelsea supporter. For about the last dozen years clubs and leagues, primarily European but also from the Americas, have been looking for ways to make inroads into Asia and develop a potentially lucrative fanbase in a continent that boasts over half the worlds population and many of its fastest growing economies. What they are probably finding out quickly is that if you are not Barcelona, Manchester United or any of the ten or so elite clubs in Europe, your likelihood of developing a vibrant following in Asia is extremely small. That is because there are basically only two ways to develop fans in Asia – winning trophies or signing an Asian player. Everybody likes a winner. You can multiply that by a thousand when the teams you might potentially root for are half way around the world. For every oddball who will support a club because of their colors, nickname, website design or a come-and-get-me plea, the great majority become fans of teams that win trophies. Besides the obvious fact that following a team that wins is exciting and fun, winners are on TV more, play in continental championships such as the UEFA Champions League and lend their players to the best national teams, thus they have many platforms to drum up support and engage their followers. On the other hand clubs that do not win trophies slip off of the radar and have little to offer potential fans that have no geographic or family connections to the club. Even marketing or charitable endeavors they might have been involved in a region of Asia is usually not enough to turn the people in that area into proper supporters. If a club is not able to win trophies the only other way to develop Asian fans is by signing an Asian player, though this tactic might not work as well now as it once did in places like Japan and South Korea that have a large contingent of players in Europe already. Asians tend to be quite jingoistic so if a foreign club signs one of their countrymen they will be likely to root for that club. I remember in my college days in Thailand when English lower division side Huddersfield Town signed local hero Kiatisuk Senamuang you could find kits of The Terriers, be it the knockoff variety, all over Bangkok. Signing an Asian player however might be a pretty short-lived strategy, especially at the rate at which players change clubs these days. I doubt many people in Japan continued to follow Italian side Perugia after Japanese star Hidetoshi Nakata left the club. All this is not so say that a club will not get a few fans here and there by executing some marketing initiatives in Asia, but in the end the ROI will probably not even cover the flight and hotel expenses of the club’s marketing director’s trip to Asia. Before the also-rans and minnows of world football write-off Asia as 'good for nothing' there are still many revenue generation opportunities in the continent, it just will not come via trying to develop an Asian fanbase. Regions and venues looking to promote themselves still may find value in writing a paycheck to bring over a known foreign club, even if they are not one of the elites. There might be opportunities to sign deals with satellite channels looking for more content or cheaper programming. Asian companies keen to enhance their profile abroad (or even at home) could find benefits in sponsoring foreign clubs and leagues – especially with the B2B and B2E opportunities the sponsorship might also generate. And then there is always the dream possibility that an Asian billionaire on the lookout for a new toy to play with will purchase your club. Author's note: The irony of this article is that I myself became an Aston Villa supporter after randomly selecting them as my team when playing a football management video game at my home in Kathmandu. I kept an eye on the club and gradually turned into a passionate fan ever since. And yes, I did have a small role to play in getting Aston Villa to donate those kits to the Nepali club. Nepali football hit another pothole when the country’s oldest football club, New Road Team (NRT), decided it would not participate in 2013/14 (B.S. 2070) edition of the Martyrs League ‘A’ Division. As is tradition in Nepal’s football sector, NRT were quick to blame the All Nepal Football Association (ANFA) for their predicament. Though a few of their complaints certainly seem valid, it is hard to have sympathy for an 80 year-old club that has failed to develop its own football facilities, an active fanbase or a youth academy. Club football has a long and winding road ahead of it! NRT cited their massive debt payments as the principal reason for their withdrawal from Nepal’s top division and hinted that ANFA should have given them a fatter check to cover their losses. History shows us that if you give a Nepali club 1 Rupee they will spend 2 Rupees and if you give them 1 crore they will spend 2 crores, so it is difficult to envision that any extra subsidy to NRT by ANFA would have healed NRT’s wounds. Besides – if ANFA sent NRT a bonus, they would have to do the same for every other ‘A’ Division club which would inevitably create inflation in the player market thus putting every club right back to where they started. There are however other more prudent actions ANFA can take to help Nepali clubs develop, become sustainable and more professional. Below are 5 of them. Perhaps NRT, with their revered stature in Nepali football and leadership role at ANFA (NRT’s president Narendra Shrestha is an ANFA Vice President and on the AFC Youth Competitions Committee) should have been publicly fighting for some of points below instead of taking their ball and going home. Currently, club officials play a large role in the daily running of the Martyrs League. Therefore much of the league’s structure such as scheduling, allocation of prize money and even referee appointments, tend to favor some clubs over others. An independent league management office made up of professionals that are not associated with any clubs would help make the Martyrs League much more fair to all participants and also help inject some competence to the governance of the League. Clubs in general are averse to change. Club licensing is a way to force clubs to professionalize themselves by creating minimum standards they must meet to obtain a “license” that will allow them to participate in football competitions. Such standards could be as simple as having to have a club’s logo on their jerseys or as complex as a club needing to have their own stadium. The AFC has many club licensing templates that ANFA could easily modify and adopt. It’s not rocket science! There are many activities that Nepali clubs neglect because they do not see much benefit in spending resources on them. For example clubs virtually have no marketing and fan development strategies because League ticketing is controlled by ANFA. If ANFA were to give clubs a quota of tickets and a club’s income from a match came solely from being able to sell their own tickets, then they would be far more inclined to start developing a fanbase. How much money does the winner of the FIFA World Cup earn? It is a question that most people would probably have to Google. We however know exactly how much Nepali clubs will earn by winning the Martyrs League, NCell Cup and the Aaha Gold Cup. Prize Money is a Nepali obsession that needs to be de-emphasized. Teams that win will undoubtedly get better sponsors and more local support, so it would be fairer and create more competitive football if the prize money pot was transformed into a “participation fee” that was divided somewhat equally amongst all clubs. In the 2012 English Premier League for example first place side Manchester City received 60 million Pounds from the Premier League while last placed Wolverhampton Wanderers were allotted 40 million Pounds (67% of what the first place team received). Meanwhile in Nepal the first place side receives 78 lakhs (75 lacks prize money + 3 lacks participation fee), second place 38 lakhs and teams nine through sixteen a measly 3 lakhs (4% of what the first placed team received). In Nepal players are only given one-year contracts, thus clubs lose out on a valuable income source – transfer fees. Furthermore, because players are able to walk away from their clubs so easily, clubs are reluctant to develop youth academies and invest in the development of their current players. By creating policies that encourage long-term contracts such as clear player transfer guidelines and strong penalties for players that break their contracts (and similar penalties for clubs that do not pay their players on time), clubs would be more likely to sign players to long-term deals which would give them an opportunity to then sell players down the road if they needed to raise capital. I remember when football was very popular in Bangladesh and they had some of the strongest clubs in the region. Then came success in cricket and football turned into an after-thought in the country. 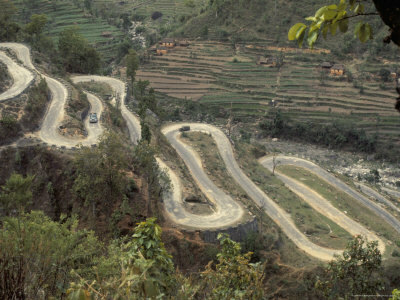 Could this be Nepal's fate in the years ahead? I certainly hope not, but how many times does the national team have to flop for people to realize that cash rewards do not make players better. Good players make money, money does not make players good. You want to win - develop competent coaches, get serious about youth football development (one academy and a single school tournament a year is not enough), force clubs to professionalize through club licensing and run a 6-8 month league played mostly on weekends for the benefit of fans and the health of the players. With hundreds of thousands of Dollars pouring in from FIFA and millions of Rupees coming from the Government, writing a cheque is pretty easy. Developing a sound football development strategy - now that takes some true grit. Could Nepali football have found its savior? No it is not any visionary football official, ANFA Academy hotshot or fanatical corporate tycoon - and it certainly is not anyone named Graham, Jack or Richard. Nepal’s football savior might just be the 40 meter X 20 meter artificial turf carpets that are popping up across the country. 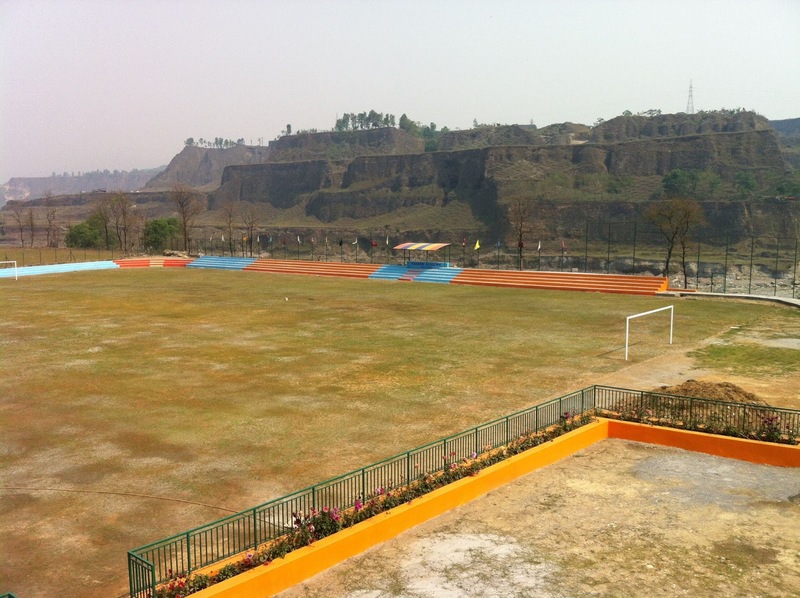 Within the next six months there will be close to twenty futsal fields in Kathmandu and Pokhara combined. In a country where football development initiatives are rare as a tiger at Chitwan National Park or dubious as the Yeti, the futsal boom is a much-needed boon for Nepali football. Futsal, a 5-a-side variant of football that is usually played indoors, originated in South America and has helped develop and define Brazilian football. Most Brazilian soccer stars grow-up playing futsal before graduating to the grand form of the beautiful game around age 12 or 13. The brilliant technique, movement and passing Brazilian footballers are admired for is often attributed to the countless hours they spend on futsal courts. While Nepal is mountains away from becoming the next Brazil in football, futsal certainly seems capable of bringing about a renaissance to Nepali football. What it offers most is that it helps fill the void for many of Nepal’s shortcomings in football. 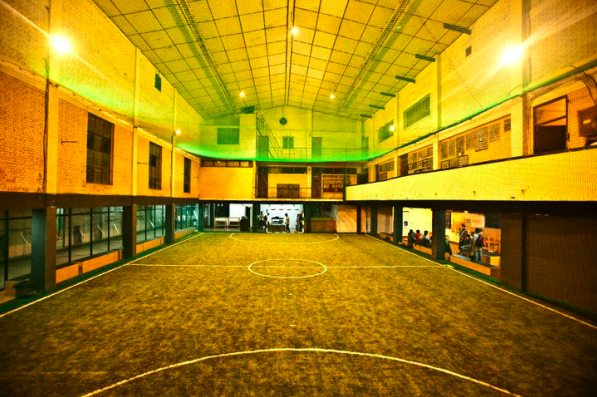 The lack of playing areas and shortage of tournaments that plagues Nepali football is slowly being cured by the new futsal facilities. Soccer tournaments are now dime-a-dozen and anyone who wants to kick around a ball with friends can go down to their local futsal hall and make a booking. 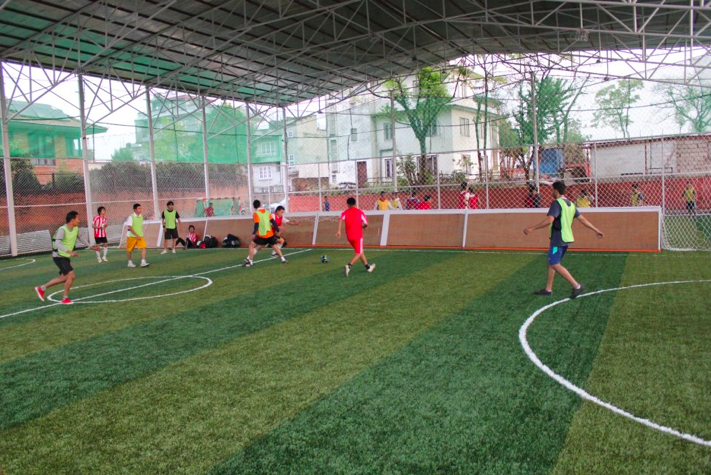 One futsal court operator estimates that on a given day over 1000 Nepalis are playing futsal. Extrapolate that over a year and you get 365,000 futsal participants, the majority of who would otherwise not be active in any form of football. With futsal facilities looking for ways to maximize occupancy they have initiated many programs that the national football governing body – ANFA, has long neglected such as football training for young kids and recreational tournaments for the likes of seniors, girls, schools and corporates. The abundance of futsal facilities has even prompted a major international youth football development program to seriously inquire about expanding their business into Nepal. Visit a futsal facility and its impact is abundantly clear. Kids are kicking balls in real life instead of virtually on FIFA 13. Teens are developing techniques they might not have mastered on bigger and more decrepit fields. National team and club players are now staying in shape year round. Ironically, the one thing that futsal has greatly benefited from is that ANFA, most likely due to their ignorance of the sport, has kept its toxic tentacles at a distance. Futsal entrepreneurs thus have not had to face political and bureaucratic nightmares when constructing their facilities or organizing tournaments which has given them the freedom to be more agile and innovative. In stark contrast to the Aaha Rara Gold Cup or the recently inaugurated Sahara Academy, one will rarely see an ANFA official at a futsal function. Given Nepal’s copycat business culture - with fairly solid occupancy, profitability and a plethora of football mad businessmen - it is likely that dozens more futsal facilities are on the verge of being built across the country. It might not be too far-fetched then to anticipate that a Nepali Robinho or Ronaldinho – two Brazilian players with strong futsal pedigree, might be less than a generation away. It has been a great few weeks for Nabin Chitrakar. In the span of less than a month he orchestrated the one million Rupee sponsorship deal between NMB Bank and Machhindra FC, engineered Rohit Chand’s historic move to Indonesian club side PSPS Pekanbaru and has helped over a dozen foreign players settle into Nepali club sides for the Martyrs League ‘A’ Division. 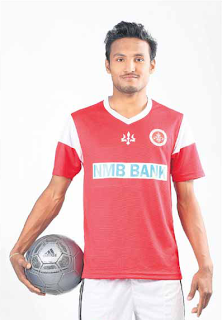 In Nepal’s football circles Chitrakar’s mobile number is quickly becoming a must have. His slew of contacts, outgoing personality and negotiation skills is slowly garnering him the reputation of Nepal’s Jerry Maguire. “I’m an accidental agent,” says the 40-year-old resident of Basantapur. Chitrakar, the director at Muktinath De Cargo, a prominent export/import cargo company based in Thamel, was asked to join Machhindra FC as an adviser to the Executive Committee six years ago. Soon he found himself not just exporting and importing cargo, but also football players and coaches. Chitrakar has been a pioneer ever since his association with Machhindra FC. He helped land Nepal’s first ever foreign coach at a club side when MFC roped in Nigerian Tope Fuja to manage their team. He later brought the first Brazilian player to Nepal in Daniel Baroni. Through his international contacts he has also helped send talent the other way when arranging a trial for Santosh Shauhukhala at Indonesian powerhouse side Sriwijaya FC. 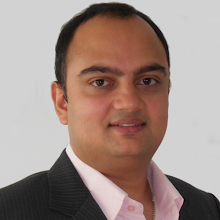 A part-time career as a sports agent has not always been comfortable for Chitrakar. Baroni struggled during his single season in Nepal and several African players brought in by Chitrakar found glory not at Machhindra but for rival clubs. “What people fail to understand is that environment plays a big factor for players. Baroni was playing in the top leagues in Malaysia and Indonesia and could not adjust to the awful pitch at Dasarath Rangashala,” defends Chitrakar. Another sensitive issue for Chitrakar is money. Seeking commissions and remunerations is still frowned upon in the close-knit world of Nepali football. Chitrakar asserts that he has not asked for payment on most of the deals he has put together, though he does plan on charging fees going forward. The upsides however have far outweighed the downsides of being a sports agent. Rohit Chand’s signing with Indonesian Super League side PSPS Pekanbaru might be a seminal moment in Nepali soccer. Already numerous Indonesian and Asian football outlets have featured posts and articles about Rohit’s historic signing. Chitrakar is also very enthusiastic about the sponsorship deal he helped put together between NMB Bank and Machhindra FC. He says it is a groundbreaking sponsorship because it is much more marketing driven than an exercise in Corporates Social Responsibility (CSR). The last few NMB Bank Machhindra FC games have been attended by dozens of zealous NMB Bank staff that have provided an entertaining excursion for employees of the company. Other than his day job at the Cargo firm, there really is no life outside of football for Chitrakar. Along with his sports agent work, he is also the president of the Arsenal Nepal Supporters Club, freshly completed the FIFA Futuro course, and recently took his family on vacation to Pokhara – to watch the Safal Cup football tournament! While Chitrakar is making a name for himself, he still is a distant second in his family when it comes to fame. His younger sister is none other than Nepali pop music diva Nalina Chitrakar. However, at the rate he is closing sports deals it might not be too long before he is on level footing.